Invite 1 child to come with you by telling them you have something to show them. Tell the child to bring the basket of boxes to a selected table. Have the young child sit down before you. For choosing the first box, place the basket where the child can clearly see the contents of the basket, choose a box and then gently push the basket to where the child can still see inside but where it will not disrupt the presentation. That way for later boxes, you will not need to move the basket. Tell the child that you are going to show him how to open and close boxes. Place your right thumb on a box’s base on the point nearest to your body. Wrap your fingers (two is usually enough) around the box. Slowly and carefully lift the box out of the basket so as to not hit any of the other boxes. Place the box on the table by placing the point closest to your body down first, and then the opposite side down as well. 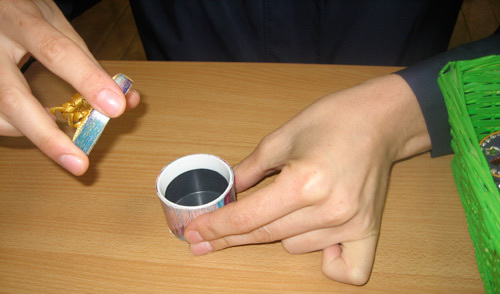 Release the box with your right fingers and then your thumb. Grasp the box comfortably with your left thumb and as many fingers as comfortable by placing your left thumb on the part of the box closest to your body and your fingers wrapped around to the other side. Place your right thumb on the box’s lid above your left thumb. Place your right index and middle finger on the lid on the opposite side that your thumb. Lift the lid directly into the air. Lower the lid to the table. Place the lid slowly on the table with one point of contact at a time. Release your right fingers and then your left. Release your left fingers and then your thumb. Place your left hand on the box the same way you did as when you began opening. Place your right thumb on the box’s lid on the part closest to you. Place your right index and middle finger opposite your thumb. Place the lid on the box’s, making sure it fully covers the opening. Give the lid a little press until it is securely on. Lift both right fingers and then your thumb. Lift your left fingers and then your thumb. Place the box in front of the child and offer the child the opportunity to open and close this box. Once the child has been successful, ask the child to place the box gently on the top left corner of his table. If the child had some difficulty, demonstrate again with another box, possibly asking the child to choose the box this time. Continue the presentation if the child seems to need them but if not, let the child finish opening and closing the other boxes. Once the child has opened and closed all the boxes, come back and demonstrate how to gently put one box back in the basket at a time and then to place the basket back in its place. Direct: To assist the child to independently cope with opening and closing boxes. . Indirect: To strengthen the hand and wrist muscles. Feeling the lid slide down on the box. This Montessori Video shows how to present a child with opening boxes.